Toni Kostian & Lauri Kähkönen opened Grön in 2015 on a small street in the design district of Helsinki, Finland. Kostian won Top Chef Finland in 2016. 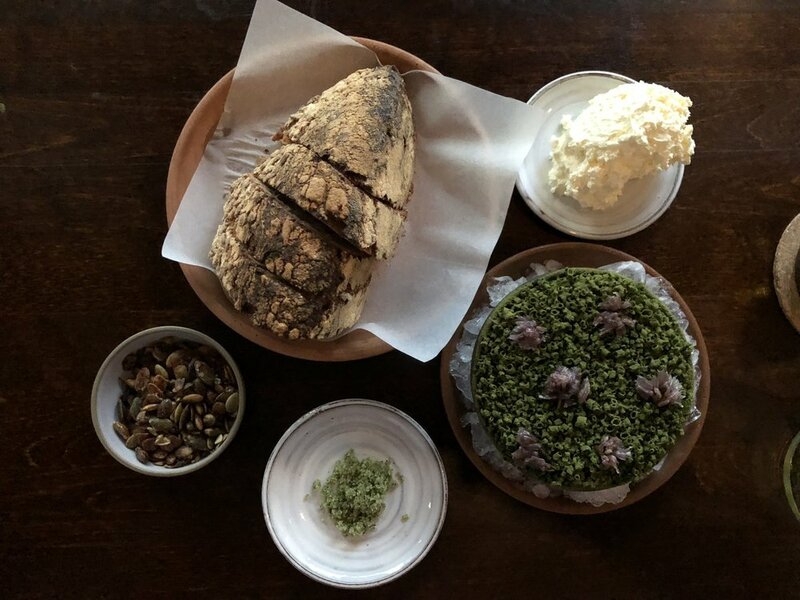 Among its many other accolades, Grön won the Finnish Gastronomy Society's "Restaurant of the Year" in 2017. The restaurant received its first Michelin Star in 2018 and is one of only five restaurants in Finland to hold a star. Grön offers a fixed tasting menu for 54 euros. You can choose from their standard or vegan menu. We chose the standard, which was basically a half step up from being vegan. They also have a few add-ons you can get, which of course we got, because that's the way we roll. Yvonne loves sour cream, so we ordered the 10 euro supplement and she almost got sick eating it all. The butter was delicious, as it was grilled first and then whipped. This was the winner of the savory dishes for us. The "grass sauce" was a perfect mixture of sweet and sour. The potato was cooked perfectly underneath everything, which added a nice earthy tone to the dish. 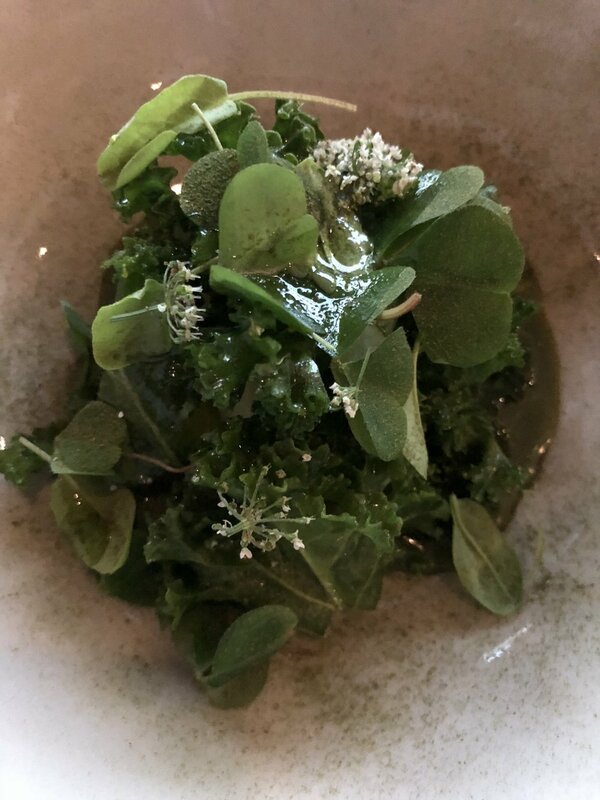 This dish highlighted the local lovage, which is similar to parsley. On top of shredded lovage, mixed in was sliced lovage, and poured over was a lovage sauce. The pastry bottom was the highlight for me of this dish, as well the mixture of textures--from the crunchy peas, to the tender beef, and flaky pastry. The "fish" dish was really all about the carrot, which was chopped and grilled, and then arranged in a flower shape topped with shaved carrots. The shrimp broth was a 24-hour shrimp sauce poured over. We both agreed this dish was too carrot forward for both of us, and was missing an oompf we expected for the main course. This was the supplemental cheese course, which consisted of a green strawberry topped with a goat cheese. This was a cool concept, but nothing to really write home about. This was our second favorite course after the salad, and wow, was this amazing! A strawberry granite (or granita), topped with a rhubarb flower, and covered in woodruff sauce, meringue, and cream. Despite all of the elements at play, the dish blended together seamlessly to create a great symphony of tastes in each bite. Grön has a concentrated wine list focused on organically produced wines. The wine list is hand written in a notebook, which was super adorable. They also serve one gin, which is the traditional liquor of choice in Finland. This was the smallest restaurant we have ever been to, with 12 two-person tables and the kitchen all in the same space. The restaurant couldn't have been more than 400 square feet. This made for a very family-like atmosphere, where we felt as if we were dining in someone's home kitchen. The decorations consisted of a large abstract painting on one wall and containers filled with dried and aging ingredients on the other. Summers in Finland are long, with the sun setting around 11:00pm and it not really ever getting 100% dark, so it was a very surreal experience eating dinner at 10:00pm in almost complete daylight. What you'll find in Finland is that people are very even-keeled and not particularly prone to small talk, so when you are in a bus or train it can be completely silent; however, Finnish people are exceptionally nice and will go out of their way to help you. The wait staff at Grön fit this description to a tee, with the waitress seeming almost shy, but as soon as you asked her a question she would answer it in a very thoughtful, thorough way that makes you think the Finnish people have figured out the proper way of communication. The chefs hand delivered each dish to us and explained the dishes thoroughly, although sometimes we crude Americans couldn't understand it through their Finnish-accented English. Americans are so behind the rest of the world when it comes to knowing languages! We talked a lot this trip about how we will put our future Scallionpancake children in language immersion schools one day. Frankie isn't allowed to come to Finland in the summer because he would party too hard with all the daylight; Reindeer is an underrated meat and it should be served throughout the world, sorry Rudolph; Saunas are really hot - too hot for two country bumpkins from the states; The Nordic countries are #frenchbulldognation, which we feel like is one of their only fatal flaws--where are all the pugs?